Airtel launched it's own 4G LTE network sometime this year making it the last telecommunication company in Nigeria to introduce its own 4G network. Airtel has managed to extend its 4G coverage to most part of the country within the short period of time and in other to encourage people to try out it's LTE speed, the Telco is giving it's customers free 4GB data. 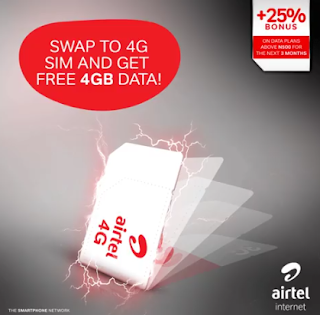 Even though the method of activating the Airtel free 4GB data is pretty straightforward and doesn't require any code, some people still encounter issues while trying to activate it. So in this post, I will explain in details all what you need to know about the Airtel 4G free 4GB data and how to get yours. >> Visit any Airtel experience center to buy a new 4G SIM or you can also retrieve your old 3G SIM for a new SIM. >> After that, insert the SIM into a 4G enabled smartphone. >> Once your phone displays the 4G LTE signal, you will get your free 4GB data almost immediately. >> To check your data balance, just dial *140#. >> You can only get this Data once and it's valid for a month. >> You can't get the data on the same phone twice even if you use a different SIM. >> No code is needed to activate the data. You will receive the data once the 4G signal appears on your phone. >> The data will work only on 4G network, which means you have to insert the SIM in a 4G enabled device and there must be Airtel 4G coverage in your area before you can use the data. If you still have any question to ask, feel free to drop it in the comment section below. Also, don't forget to kindly share this post on your various social media platforms. I have 2 airtel 4g sims, only one got the 4gb, will changing my imei make the other one work? Can infinix hot 4 lite support 4G network?